...to 2011. 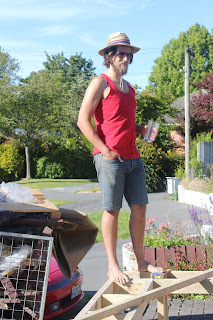 It's been a year of highs and lows, as I guess all years are, but the Christchurch earthquakes made the lows pretty big. 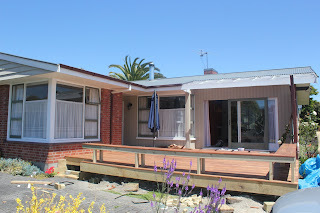 This was my first visit to my daughter and her partner's new home in Bryndwyr, Christchurch, which fortunately was an area not badly damaged by the quakes. I was hoping there would be none while I was there, but unfortunately, this wasn't the case. The day following, we had a 5.8 magnitude followed by a 6.0, plus a multitude of smaller shocks. Really we could have done without that. However, the house stood up well. As my son Cass was also there for a few days and would be bored with nothing to do (family trait), he offered to do a project for Sophie and Mark. 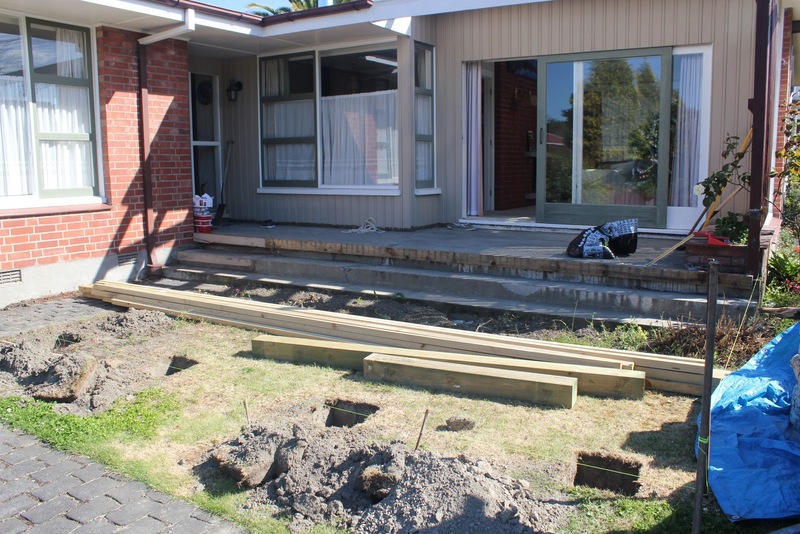 They wanted a deck, so Cass designed this (he is a structural engineer/architect) and started work. 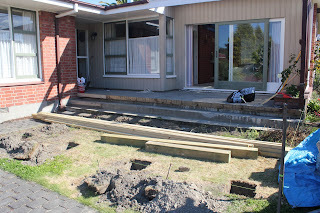 By the time I arrived on Thursday afternoon, the old timber decking that had been on top of the concrete had been removed, and post holes had been dug. Sophie was a willing helper. Mark also helped, as did a few friends from time to time. Actually, any visiting male wanted to join in. I didn't help, I merely documented the whole process so Sophie and Mark could look back on how it came together and what it looked like before - because you forget. Here's Cass surveying the work so far. The framework went up quickly - this photo was taken Friday evening. Work didn't stop for the quakes. Laying the kwila decking was the slow part, and took all Saturday (Christmas Eve) and Sunday morning. By 2pm on Christmas Day, this is how it looked - the raised seating along the outer 2 sides was a great idea. The steps will have to come later. 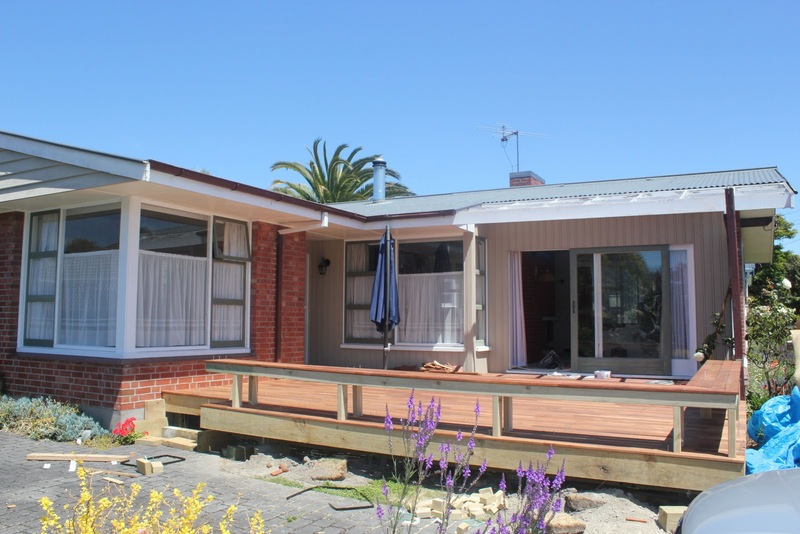 The deck is 35 square metres (377 square feet), so quite a substantial size - 1/3 of the size of my whole house. Of course, the kids didn't work the whole time. There was quite a bit of this as well. 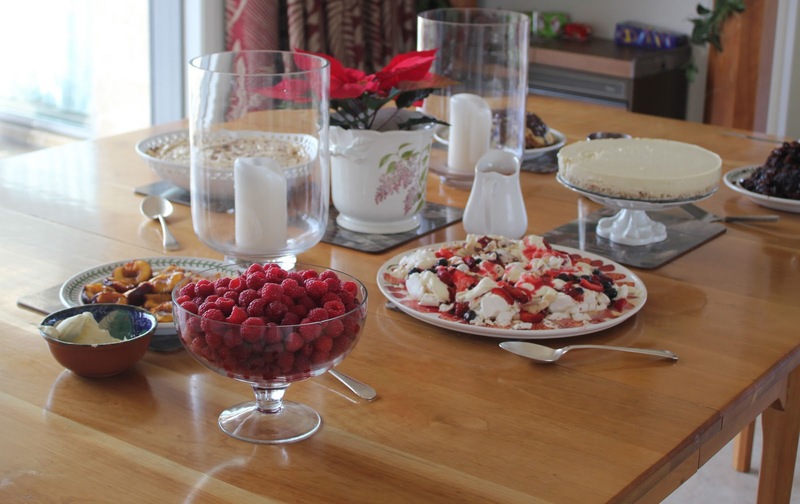 This is the dessert table at Mark's extended family Christmas dinner. All in all, I had a lovely time despite the earthquakes. It was an 8 hour drive each way, but the weather was good and the traffic light. Was this a wonderful working holiday? 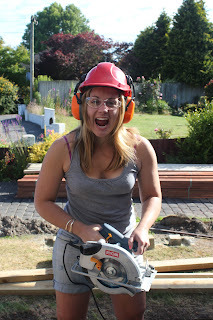 Sophie will be so pleased with the new extension. So good to know you were all safe, and you are home safely too.Up here we cannot even begin to know how Chch people feel this time, devastation would not come even close. Happy New Year to you, and all yours. Cheers from Jean. So great psot really happy for you! MArry Christmas! What a great group effort. Would you all like to come here next? I am awaiting a new deck. If I can persuade Cass to come here (Stewart Island is the drawcard, not me), I might be able to get him to build me a covered pergola. Excellent article, I will recommend my friends to read it.